Suprapubic Prostatectomy with and without Continuous Bladder Irrigation in a Community with Limited Resources. Department of Surgery, AIC Kijabe Hospital, P.O. Box 20 Kijabe 00220, Kenya. Background: BPH is the commonest benign tumour in men Its incidence is age-related. Whereas suprapubic Transvesical prostatectomy (SPP) continues to be the main surgical approach in most parts of Africa, trans-urethral resection of the prostate (TURP), has become the gold standard in the West. Haemostasis is critical in prostatectomy. This study was aimed at comparing suprapubic prostatectomy with and without continuous bladder irrigation. Methods: Between September 2004 and January 2006, the authors ran two surgical outpatient clinics. All the patients requiring suprapubic prostatectomy seen on a Tuesday underwent the traditional procedure using continuous bladder irrigation, while those seen in the Thursday clinic underwent the procedure without continuous bladder irrigation, using the modified Malement stitch. Results: In resource-poor settings, the advantages of suprapubic prostatectomy without continuous bladder irrigation are highlighted, including a 12% bill reduction, a shorter hospital stay by 2 days, and with no increase in complications. Conclusions: Suprapubic prostatectomy with a modified Malement stitch and without continuous bladder irrigation is simple to perform, safe and easy to learn. This procedure permits patient ambulation as soon as spinal anesthesia wears out, reducing the risk of the occurrence of deep venous thrombosis. With the radical removal of bladder infusion solutions and reduced need for nursing attention, it is easily adaptable to resource-poor environments, resulting in significant savings for the family, as well as the institution. Because of a reduction in post-operative bleeding, the need for re-operation for clot retention and transfusion is minimized. Early patient discharge home allows for a lower cost of hospitalization and earlier return home. Suprapubic transvesical prostatectomy was first described by Fuller and later popularized by Freyer1 . Whereas SPP continues to be the main surgical approach in most parts of Africa, trans-urethral resection of the prostate (TURP), has become the gold standard in the West, accounting for up to 90% of prostatectomies performed for BPH2 – 4 . Haemostasis is critical in this procedure because the patients are often elderly and frequently have co-morbidities5, 6 . Blood loss and clot retention are minimized by a rapid procedure and post-operative continuous bladder irrigation (CBI) using normal saline solution. The CBI requires constant nursing supervision. Over the years, surgeons have employed different techniques in order to reduce perioperative blood loss and postoperative clot retention. The general surgical team at AIC Kijabe Hospital (KH), a hospital in rural Kenya performs between 200 and 250 prostatectomies each year. Between September 2004 and January, 2006, patients were randomly referred to the Tuesday and Thursday Surgical clinics from the General Outpatient Clinic. All the patients, requiring SPP seen on a Tuesday, underwent the traditional procedure using CBI, while those seen in the Thursday clinic, underwent SPP without CBI but using the modified Malement stitch. Patients operated on by surgeons other than the authors were excluded from the study. Surgical technique. Open prostatectomy for patients on the non-CBI protocol. Under spinal anesthesia, the patient is catheterized and the bladder filled up with 200ml of a dilute betadine solution. The catheter is withdrawn and the skin prepped. An 8 to 10 cm Pfannenstiel skin incision, is made, and continued through rectus fascia. A longitudinal bladder incision is made, and a self-retaining bladder retractor placed, exposing the enlarged prostate, urethral and ureteric orifices (Figure 1). A semi-lunar bladder-neck mucosal incision is made one centimeter distal to the ureteric orifices exposing the adenoma, which is then enucleated. 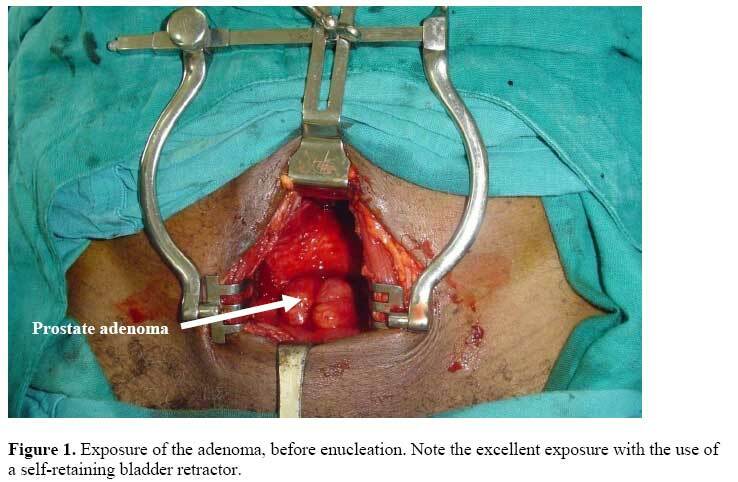 A circumferential continuous locking 2.0 chromic suture is placed around the bladder-neck, with re-trigonization of the base of bladder. A 1.0 or 0.0 Prolene® bladder-neck purse-string stitch is placed, starting in the pubic area, just below the incision and exits close to the same place. A three-way Foley catheter is inserted into bladder. This catheter is a safety valve, allowing for an easy switch to CBI, should that become necessary. The Prolene® stitch is pulled snug on the catheter, and tied over a piece of folded gauze (Figures 2 and 3). The bladder is closed in two layers, and the incision closed. No drain is left in the retropubic space (of Retzius). The bladder is flushed with 200 ml of normal saline to wash out any blood clots. A urine bag is attached to the Foley and the infusion port spiggoted. The patient is encouraged to take lots of fluids. The Prolene® suture is pulled out on the first post-operative day, while the Foley catheter is taken out on the second post-operative day. The patient is discharged home on the third post-operative day. The CBI protocol has the following differences: The bladder-neck chromic stitch is applied between 4 and 8 o’clock and no Prolene® stitch is used. CBI is allowed to run until the effluent is relatively clear, and then stopped. Seventy patients qualified for inclusion into the CBI arm of the study, while 50 qualified for inclusion into the non-CBI arm. Fiftythree (44%) patients had hypertension, while eight had diabetes. Fifty-four percent of serum creatinine results were abnormal, indicating renal impairment. Thirty patients were octogenarians.. χ2 test was performed on all the variables. There was no statistical difference in any of the variables between patients in the two arms. The pvalues were more than 0.05. A total of 76% of patients presented with either urethral (61%) or suprapubic cystostomy catheters (15%). Three patients in the CBI protocol developed post-operative wound sepsis, and required urethral catheters for an average of three weeks. CBI protocol patients had a catheter post-operatively for a mean of 5.1 days, while those in the non-CBI protocol had their catheters out in an average of 2.2 days. Non-CBI patients left the hospital 2 days earlier than did the CBI patients (3.2 days vs.5.3 days), and spent US $36 less for their care. The average weight of prostatic tissue was 66.5 g, (8 g to 275 g). The decision to perform an SPP or TURP was, based on the digital rectal examination, with TURPs for 'small prostates' and SPPs for 'moderately enlarged' and 'large' prostates. In general, at KH, there has not been a uniform policy on patient follow-up. Because of financial constraints and long travel distances, most patients require review only if they develop complications. A total of 65% percent of patients were reviewed postoperatively. Acute complications were seen in 68% of all the patients by the time of discharge. Eleven patients developed transient bladder atony post-operatively, and were successfully treated with recatheterization for 24 to 48 hours. Incontinence and meatal stenosis persisted beyond 4 weeks in eight patients (six from the non-CBI arm and two patients from the CBI arm), 6% of patients. 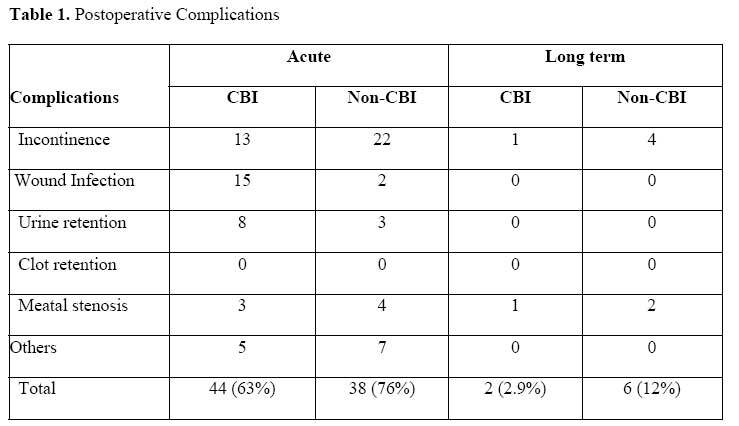 One patient, managed by non-CBI had persistent stress incontinence at 1 year post-operatively; all the others had recovered well. There were 8 (6.7%) clinically significant cancers, 6 of which were incidental findings. Figure 3.The modified Malement Stitch. BPH is the commonest benign tumor in men and its incidence is age-related9. Symptomatic BPH causes lower urinary tract syndrome (LUTS) and significantly affects the quality of life of the patient10. LUTS afflicts between 20% to 50% of men, 60 years of age6, 11, 12. Though many non-surgical options exist for the management of BPH, the only one affordable for many in resource-poor settings is an indwelling urethral catheter. SPP with CBI and a double 2-way Foley catheter construct (urethral and suprapubic), is the commonest procedure performed in rural African hospitals. Significant perioperative hemorrhage is a major concern in SPP, and requires vigilant post-operative CBI monitoring and changing of irrigation fluid by nurses, as well as the occasional emergency return to theater for clot retention. As a result, few surgeons are comfortable performing SPP in small, rural hospitals. One patient in the non-CBI arm presented with life-threatening haematuria that required an emergency SPP. He received two units of blood pre-operatively, and was placed on a CBI intra-operatively. Only 2 patients (2.9%), both in the CBI protocol, required blood transfusion. Hill and Njoroge reported a 4.7% transfusion rate8. Transfusion rates after SPP range from zero to 36% 5, 6, 13-16. Amen-Palma and Arteaga12 reported transfusing up to 11 units of blood for post-prostatectomy bleeding, while Serratta et al16 reported significant intraoperative bleeding in 11.6% of 1800 patients. Thus, perioperative hemorrhage may be considered the biggest challenge in the performance of an SPP. As a result, surgeons have over the years, have developed ingenious operative innovations aimed at improving haemostasis during prostatectomy. 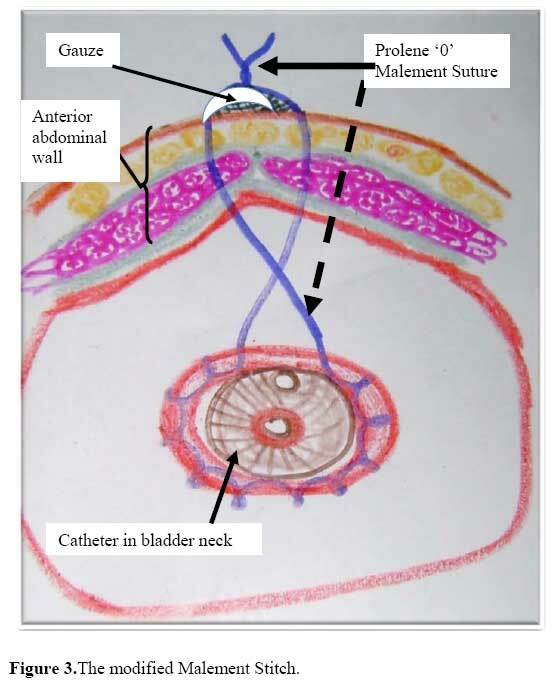 De La Pena and Alcina17 used a removable bladder-neck purse-string suture, to separate the prostatic fossa from the bladder. Malement7 used a removable suture in 1965 and noted a reduction in post-operative hemorrhage. Other authors using this technique have reported similar successes reducing post-SPP hemorrhage6, 13. The results of our study confirm that the use of a non-absorbable bladder-neck purse-string suture reduces post-SPP bleeding and totally removes the need for CBI. The operative procedure is simple, easy to learn and perform. While it significantly reduces blood loss, it does not increase the operating time, cost, or complications. The Prolene® suture is preferred because of the ease with which it can be removed. In our experience, other monofilament non-absorbable sutures are not as good as Prolene® in this regard. 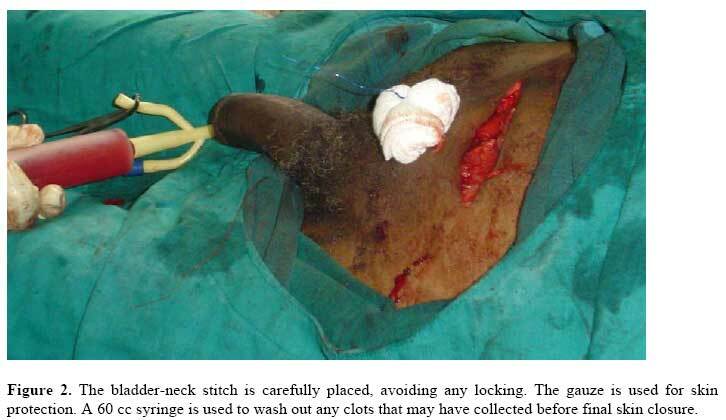 The complications of broken suture in studies that used other sutures attest to this6, 13. Absorbable purse-string sutures have the theoretical risk of increased bladder-neck strictures, a known complication of SPP5. We believe that any additional drains as in the Denis technique5 or suprapubic catheters expose the patients to unnecessary risks, such as vesico-cutaneous fistulas. From our results, urethral catheters can safely be taken out on the second post-operative day, and the patient discharged home the next day. We had no patients with clot retentions requiring return to the operating room, a common complication of this procedure13,14. Our results, though from a smaller group of patients, compare well with those reported by Meier et al13. We recorded a much higher immediate post-operative complication than any other study, at 68% and a particularly high early incontinence rate. This was probably related to the age and early discharge of our patients. Non-CBI protocol patients were discharged after 72 hours, without catheters, the earliest reported discharge from a resource-poor environment. Thirty (25%) of our patients were octogenarians. Nadu et al10 noted significantly higher complication rates in octogenarians undergoing open prostatectomy. Our study concurs with their observation. The late complication rate of 6% drops similar to other series5. Condie et al.6 reported an 8% early complication, with 2 deaths, in a study of 200 patients, while Meier et al.13 had a complication rate of 19.6%, with no deaths. Ceylon reported a 35% overall complication rate14. Whereas Hill and Njoroge, reported a 0.9% mortality rate in 2002, there were no deaths in this study8. Non-CBI protocol patients had their catheters taken out on the second post-operative day. Ceylon discontinued catheters at 48 hours14, while both Condie et al.6 and Meier et al.13 discontinued urethral catheters on the seventh post-operative day. 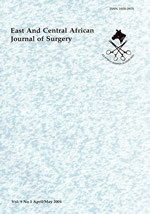 Considering the favorable results of our non-CBI protocol, the assertion made by Serretta et al.16 and restated by Helfand et al.15, that open prostatectomy is associated with relatively lengthy hospitalization and recuperation periods, along with a perceived greater perioperative blood loss in comparison to contemporary alternative methods, can no longer be held to be true. The non-CBI protocol has several advantages. It is simple to perform, safe and easy to learn. It is a significantly less labor-intensive, affording nursing staff opportunity to attend to other patient needs and therefore potentially enhances the level of patient care. Use of the modified Malement bladder stitch permits patient ambulation as soon as spinal anesthesia wears out, potentially reducing the risk of occurrence of deep venous thrombosis. These patients spent an average 12% less money for their surgery and hospitalization, and were discharged an average of 2 days earlier than those under the CBI arm. With the radical removal of bladder infusion solutions and reduced need for nursing attention, the non-CBI SPP should be easily adaptable to similar resource-poor environments, where any financial savings in healthcare result in significant savings for the family, as well as the institution. To Dr. Selvekumar Vettivel, for his assistance with the manuscript. Freyer PJ. A new method of performing prostatectomy. Lancet. 1900: 155: 774–5. May F, Hartung R. Surgical Treatment of BPH: Technique and Results. Eur Assoc Urology Update Series 2, 2004, 15–23. Mebust WK. Surgical management of benign prostatic obstruction. Urology (suppl) 1988: 32: 12-5. Han M, Alfort HJ, Partin AW. Retropubic and suprapubic open prostatectomy, in Campbell’s Urology. P.C.Walsh, A.B.Retik, E.D.Vaughan, A.J.Wein, Jr. (EDS), Philadelphia, W.B. Saunders, 2002, 1423-34. Lezrek M, Ameur A, Renteria JM, El Alj HA, Beddouch A. Modified Denis Technique: a simple solution for maximal hemostasis in suprapubic prostatectomy. Urology. 2003: 61: 951–5. Condie JD, Cutherell L, Mian A. Suprapubic prostatectomy for benign prostatic hyperplasia in rural Asia: 200 consecutive cases. Urology. 1999: 54: 1012-6. Malement M. Maximal hemostasis in suprapubic prostatectomy. Surg Gynecol Obstet. 1965: 120: 1307–12. Hill AG, Njoroge P. Suprapubic transvesical prostatectomy. East Afr Med J. 2002: 79: 65-7. Presti JC. Neoplasms of the prostate gland, in Smith’s General Urology. Tanagho EA, Mc Annich JW. (EDS), McGraw-Hill, 2000, 399-421. Nadu A, Mabjeesh NJ, Ben-Chaim J, Kaver I, Matzkin H, Greenstein A. Are indications for prostatectomy in octogenarians the same as for younger men? Int Urol Nephrol. 2004: 36: 47–50. GarrawayWM, Collins GN, Lee RJ. High prevalence of benign prostatic hypertrophy in the community. Lancet. 1991: 338: 469-71. Amen-Palma AJ, Arteaga RB. Hemostatic technique: extracapsular prostatic adenomectomy. J Urol. 2001: 166: 1364–7. Meier DE, Tarpley JL, Imediegwu OO, et al. The outcome of suprapubic prostatectomy: a contemporary series in the developing world. Urology. 1995: 46: 40–4. Ceylan K. Open Prostatectomy: The Results of a series of 320 cases in a Rural Area. Eur J Gen Med. 2006: 3: 11-5. Helfand B, Mouli S, Dedhia R, Mc Vary KT. Management of lower urinary tract symptoms secondary to benign prostatic hyperplasia with open prostatectomy: results of a contemporary series. J Urol 2006: 176: 2557-61. Serretta V, Morgia G, Fondacaro L, et al. Open prostatectomy for benign prostatic enlargement in southern Europe in the late 1990s: a contemporary series of 1800 interventions. Urology. 2002: 60: 623-7. De La Pena A, Alcina E. Suprapubic prostatectomy: a new technique to prevent bleeding. J Urol. 1962: 88: 86-90.